Last weekend was supposed to have been the yard sale, but it got rained out after an hour. We’ll try again this Saturday. Which means that the perimeter of our living room is stacked with boxes of stuff we’re willing to sell for a buck or two. It’s a profound lesson in something, I’m sure. As part of yard sale prep, I dragged out all the bins and boxes we’d shoved into the eaves of our apartment when we moved here four years ago. There were fun discoveries (So THIS is where my favorite bowl is! ), questions (why did I pack the pancake griddle in a box of frames and photo albums?) 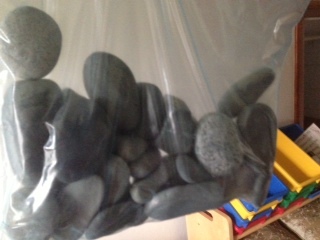 and two laugh out loud moments (when I discovered a BAG OF ROCKS I’d brought from New England to NY…and then back again, and a JAR OF PICKLES I’d canned at a canning party in NY and then packed with an assortment of votive candles and other decor. 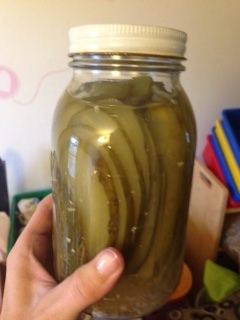 Perhaps I thought the pickles might look pretty on the mantle someday? Who knows…) It felt good to sort and purge, even if some of the stuff only made it down one flight of stairs before landing in the living room. If you live nearby and are in the market for a bag of rocks and/or a well-seasoned jar of pickles, have I got a deal for you! Aside from these odd packing anomalies, I have a pretty easygoing relationship with stuff. Rather than thinking, “I might want that someday,” I’m more prone to tell myself, “I can find a new one when & if I ever need it.” There are a few exceptions though, and they’re as nonsensical as most things we cling to for no apparent reason. 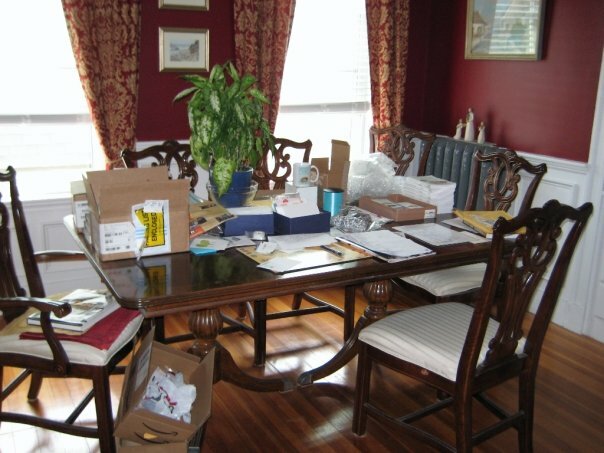 The biggest example is our dining room table and chairs, which have been sitting under a tarp in Steve’s mother’s basement since 2009. We haven’t had a dining room since then, but we will someday and I really love this table and don’t want a different one. What makes this doubly absurd is that the table has two leaves and sits 6-10 people; I panic when cooking for more than 3. And yet part of my image of a happy, satisfying life is having a place in my home where groups of people gather, eat, and talk about interesting things. Maybe we all debate a little, and come up with new ideas. It’s the people and the conversation I’m excited about in this vision – I guess in my imaginary future life also includes an outside catering budget – but it feels important in a way not everything does, so I’m holding onto it. The vision, and the table. I only have one picture from the last time we had a dining room. In it, the table is covered with stuff from the launch of my first book. It’s essentially a giant desk, and the only food that got near it that spring and summer was granola bars and oatmeal cookies from my mom. I’m sure this suggest something, I’m just to fuzzy to figure out what. But I hope this table will have many other diverse uses in our lifetime, and that I’ll remember to take pictures of them all. What things or ideas do you hold onto, hoping your future life will have a place for them? This entry was posted in Stuff & Things on September 3, 2013 by Trish Ryan.